The Windows installer provides an easy way to set up GeoServer on your system, as it requires no configuration files to be edited or command line settings. 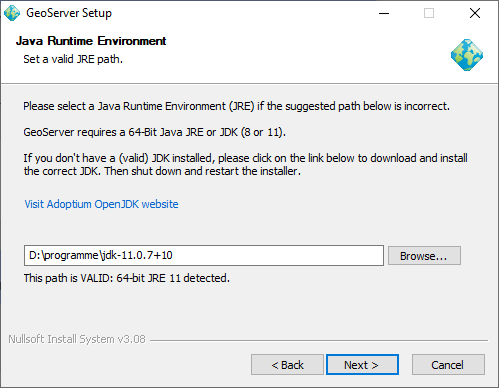 Make sure you have a Java Runtime Environment (JRE) installed on your system. GeoServer requires a Java 8 environment. The Oracle JRE is preferred, but OpenJDK has been known to work adequately. You can download JRE 8 from Oracle. Java 9 is not currently supported. For more information about Java and GeoServer, please see the section on Java Considerations. 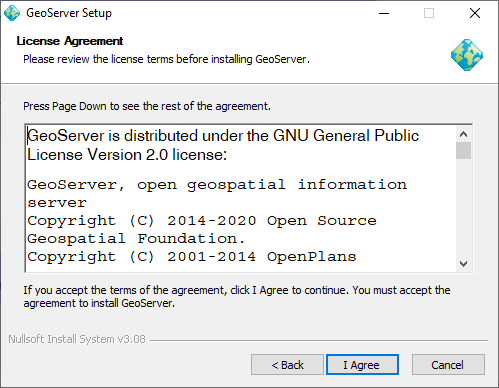 Select the version of GeoServer that you wish to download. If you’re not sure, select Stable. Click the link for the Windows installer. After downloading, double-click the file to launch. Read the License and click I Agree. Select the directory of the installation, then click Next. Select the Start Menu directory name and location, then click Next. Enter the path to a valid Java Runtime Environment (JRE). 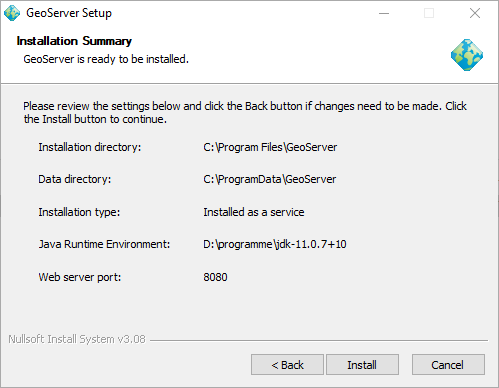 GeoServer requires a valid JRE in order to run, so this step is required. The installer will inspect your system and attempt to automatically populate this box with a JRE if it is found, but otherwise you will have to enter this path manually. When finished, click Next. A typical path on Windows would be C:\Program Files\Java\jre8. Don’t include the \bin in the JRE path. So if java.exe is located at C:\Program Files (x86)\Java\jre8\bin\java.exe, set the path to be C:\Program Files (x86)\Java\jre8. 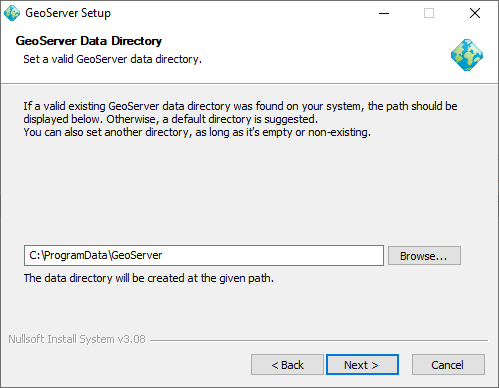 Enter the path to your GeoServer data directory or select the default. If this is your first time using GeoServer, select the Default data directory. When finished, click Next. Enter the username and password for administration of GeoServer. 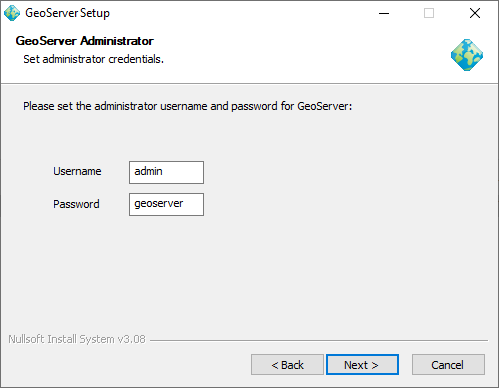 GeoServer’s Web administration interface requires authentication for management, and what is entered here will become those administrator credentials. The defaults are admin / geoserver. It is recommended to change these from the defaults. When finished, click Next. Enter the port that GeoServer will respond on. This affects the location of the GeoServer Web administration interface, as well as the endpoints of the GeoServer services such as Web Map Service (WMS) and Web Feature Service (WFS). The default port is 8080, though any valid and unused port will work. When finished, click Next. 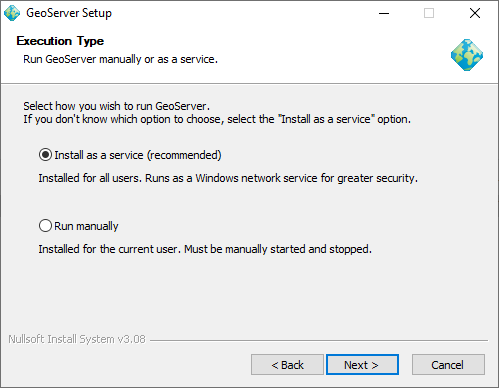 Select whether GeoServer should be run manually or installed as a service. When run manually, GeoServer is run like a standard application under the current user. When installed as a service, GeoServer is integrated into Windows Services, and thus is easier to administer. 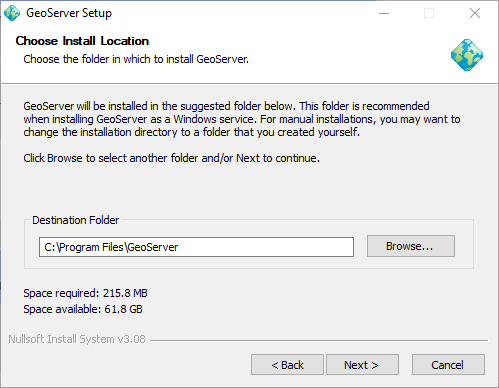 If running on a server, or to manage GeoServer as a service, select Install as a service. Otherwise, select Run manually. When finished, click Next. Review your selections and click the Back button if any changes need to be made. Otherwise, click Install. 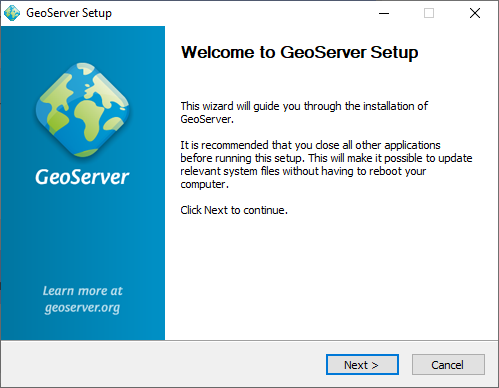 GeoServer will install on your system. When finished, click Finish to close the installer. If you installed GeoServer as a service, it is already running. 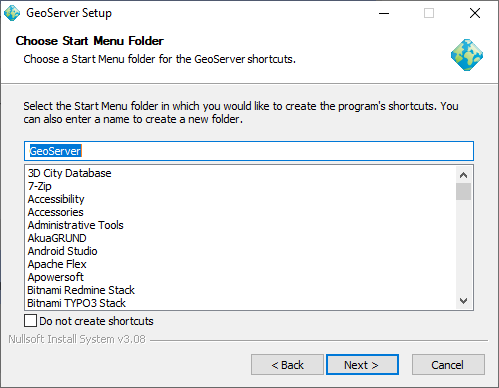 Otherwise, you can start GeoServer by going to the Start Menu, and clicking Start GeoServer in the GeoServer folder. 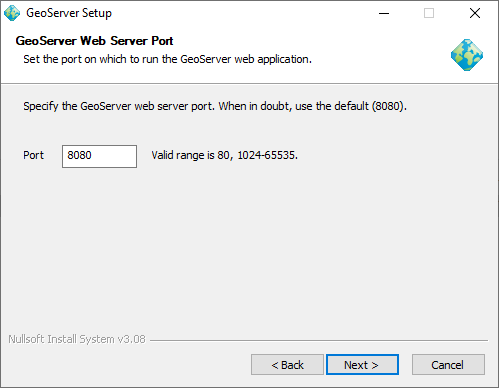 Navigate to http://localhost:8080/geoserver (or wherever you installed GeoServer) to access the GeoServer Web administration interface. If you see the GeoServer logo, then GeoServer is successfully installed. GeoServer can be uninstalled in two ways: by running the uninstall.exe file in the directory where GeoServer was installed, or by standard Windows program removal.